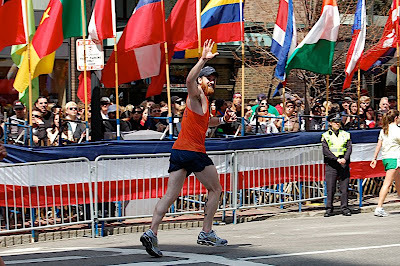 Chip O'Toole's Blog: Boston Marathon 2008! • Mile 1-3: Was packed in pretty tight and had to maneuver for position. (aka, run around slow people). • Mile 4-12: Settled down into a steady 7 min pace. Felt good, strong, fast (not for long). • Mile 13-15: Pain started to set in, but amazing crowds in Wellesley and Newton kept me going. Having thousands of people screaming your name constantly (cuz it's plastered all over your body) helps quite a bit. • Mile 16-20: Pure hell up the series of hills through Newton - aka Heartbreak. • Mile 19: Saw Erica, Mom, Karen, Jamie, Lawrence and Nicole, all in bright orange, screaming at the top of their lungs and jumping up and down like crazy people to get me over the next two hills. • Mile 20: I tried to take my mind off of the road and thought about who I was running for: the liver patients, Erica's father, my family and friends, myself. I focused on that instead of hoping for it to be over. • Mile 21-23: Started to slow down near Boston College and had an intense cramp go up the entire left side of my body while I held on dearly to a lamppost. (thank you lamppost!). Shortly afterwards heard from a spectator, "Chip, if you start running now, I'll chug a beer!". I started running and pointed back to call him out. • Mile 24: Saw a couple friends, Vic and Tiffany in Coolidge Corner for another motivating boost. • Mile 24-25: I could barely stand the pain and started to run with my eyes closed just to get through it. I knew I was close, but hearing '2 more miles!' from the crowd sounded more like '2 more excruciating miles that will take forever!'. • Mile 26: More pain and delirium. • Mile 26.2: Took the last turn onto Boylston Street and just kept chanting to myself outloud, 'All heart, all heart, all heart' over and over and over cuz that's all I had left. Caught Uncle Kevin, Dad, and Patrick at the last second to push me through those last few strides. • Crossed the finish line with my arms to the sky and my head high. • Afterwards, met everyone with hugs and kisses and I got some dust in my both of my eyes.